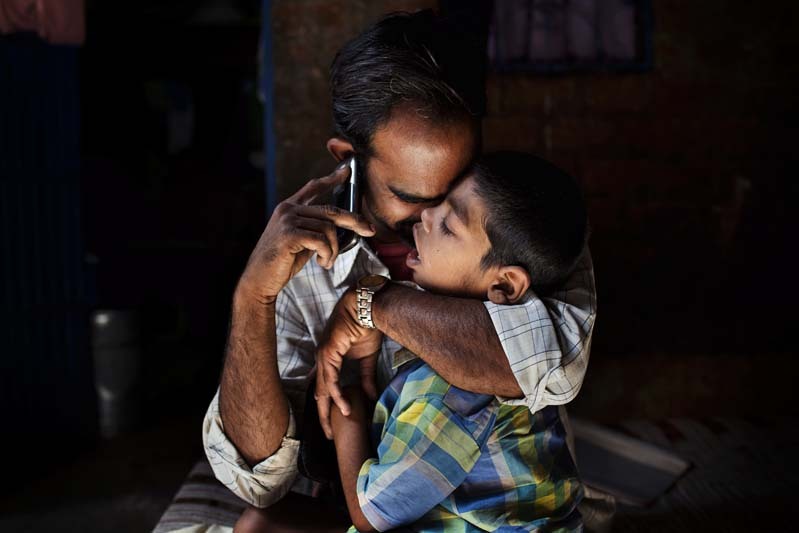 Rashid Ali, 35, a '1984 Gas Survivor', is talking on a mobile phone while hugging his disabled son Rahil Ali, 7, a boy affected by lissencephaly, inside their home in Bhopal, central India, near the abandoned Union Carbide (now DOW Chemical) industrial complex. Rahil lives with his father and deaf grandmother in a small, single room rented within a larger house. Due to the hardship and stigma associated to birth defects in India, in 2009 Rahil's mother left the family.